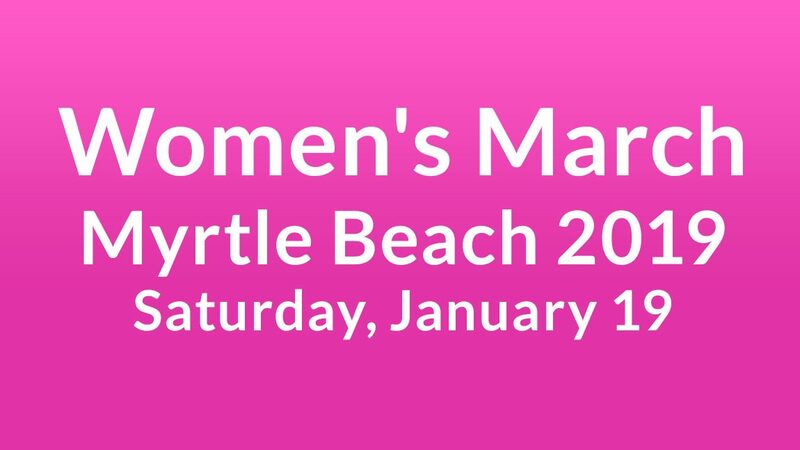 Please plan to participate in the Women’s March at Chapin Park in Myrtle Beach Saturday, January 19 from 11:00 a.m. – 1:30 p.m.. A contingent of members and supporters of the Horry County Democratic Party will attend, so please bring friends, family and neighbors out for this day of activism. Sponsored by Grand Strand Action Together (GSAT), the march is strongly supported by HCDP as we believe that we’re greater together than on our own. HCDP represents the diversity of Horry County. We support and advocate at the state and local level for equality, health care, voting rights, and advocate for a clean and safe environment. HCDP grows stronger and more vocal every day as we participate and support events such as this second annual Women’s March. Also participating is the Democratic Women’s Council of Horry County (DWCHP), whose core mission is to create and maintain a forum for women’s issues and increase perspectives through diversity. DWCHP actively seeks to identify and help prepare women to run for public office. and the youngest Congresswoman from New York. Myrtle Beach will join other cities across the nation in celebrating our victories in Congress, our resistance to the Trump Presidency, two years of training new activists and two years of building power. The keynote speaker is Caroline Mauldin of the South Carolina Future Minds, a group dedicated to supporting excellence in teaching, encouraging collaboration among public education stakeholders and connecting private financial support to public schools. A native of South Carolina, Maudlin served as special assistant and speechwriter at the U.S. Department of State and helped launch the Open Government Partnership. Mauldin also worked for leading social organizations like Oxfam America, The Carter Center and Accion International. She will speak about the history of South Carolina activism, including women’s rights activists and abolitionists who have led the way. Grand Strand Action Together, sponsor of this second annual Women’s March, is a nonprofit organization devoted to protecting and defending our democracy and the American democratic ideals of liberty, equality, and justice. As citizens, we aim to promote discussion of commonsense solutions, which are rooted in our shared interests and values as South Carolinians. Dedicated to service, education, and advocacy, GSAT seeks to address issues affecting our local community.